There are journeys and there are journeys. 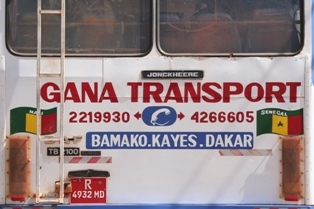 Then there is getting from Bamako to Dakar. A trip of approximately 700 km. The cost of flying is prohibitive (when travelling on a budget) and in any case is fully booked far in advance. There is a weekly train between the cities, but it’s unreliable- sometimes it goes on time, more often hours late, but mostly it doesn’t go at all. So, that leaves the bus. We were advised to travel with Gana Transport. So we bought our tickets at 25000CFA each (approx €40) and showed up at 7am at the station on Monday 3rd December, as instructed and bracing ourselves for , what we had been told would be, a 30 hour journey. We were firstly disappointed at the state of the bus – another German relic with bare bones of suspension, but we joined the queue and our bags were stowed on the roof. Nothing seemed to happen for a while, and we were constantly approached by vendors of everything from tissues to water to watches. Then, our names were called out in order and we all bustled onto the bus. 90 minutes after the appointed time, we set off. After an interminable set of rather unnecessary ramps ( the state of the road naturally limits speed, so we have never understood why these exist!) we were into the open Sahel, the sub-Saharan desertlike scrubland which dominates this area. The day passed without incident (other than occasional toilet stops where the local ladies were highly amused at a Babu (white person) attempting to maintain modesty in the open air). When we arrived at the border town of Kayes at about 8pm everyone disembarked. While most of the travellers set down on mats at the station for the night, but we decided that we might get a room…a few dead ends later we ended up in a hotel of sorts. Kayes had a border town/trucker stop feel to it, a transient, desolate sort of place with nothing by way of attraction to hold the visitor. We set off at 5 am the following morning, after swapping to an even more rickety bus. It quickly became clear that there was a missing window just in front of us. Fine at 20km an hour, but any faster…! 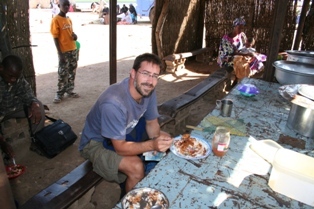 We settled in, expecting to reach Dakar late that afternoon, as we had been told by the staff. Our next stop was just over the border at Kidira, in Senegal. Once the passports were all checked, we assumed that we would be on our way. 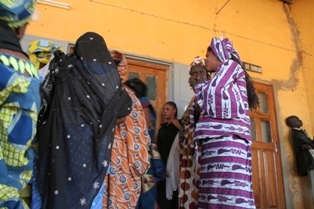 Alas this was not to be and we spent no less than 10 hours at the customs office, while all the Senegalese ladies registered their Mali purchases! A lengthy process, not helped by the fact that many are illiterate and also the office closed for 2 hours in the middle of the day. 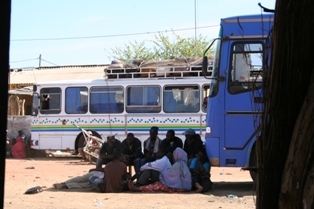 We passed the day anyhow, following the shade, trying out some local cuisine and having tea with locals on the way back from cancelling the hotel reservation at Dakar – that we had so made in confidence of getting there that night. We eventually got going towards evening. A few discussions with the staff led to getting new seats where there wasn’t a gale blowing through the open window! I had the opportunity to chat to a Dakar girl, a seamstress who does this nightmare trip every month to get cloth in Bamako and has to pay bribes to Mali police several times on each trip. It took 8 hours to get from Tambacounda to Kaolack going over the most unbelievable road ever in the dead of night, it was literally one big pothole. The bus didnt even try to avoid them there were so many! It wasn’t too surprising to see that the route was dotted with tyre repair shops – enterprising, if nothing else! 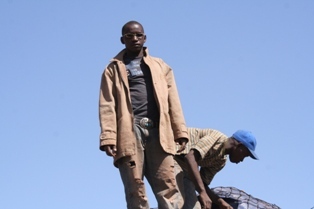 We drove all night, and got to to Dakar at 1pm on Wednesday. A 54 hour journey! 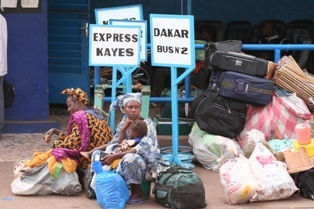 The Gare Routiere at Dakar was a riot of noise, cars, buses, people, traders and hawkers. We escaped and managed to find our hotel, the Hotel Farid, in the city centre. Once we gatherered our thoughts, we were able to get out and explore the city.